Today I’m telling you about delicious new RubyFrost apples and some flavors that taste amazing with them. This post is sponsored by the New York Apple Growers. A little while ago the New York Apple Growers Association asked me to develop recipes for some new apple varieties they’re selling. One of these varieties, the RubyFrost, is now available in New York at Wegmans, Hannaford and Tops Orchard Park Store. 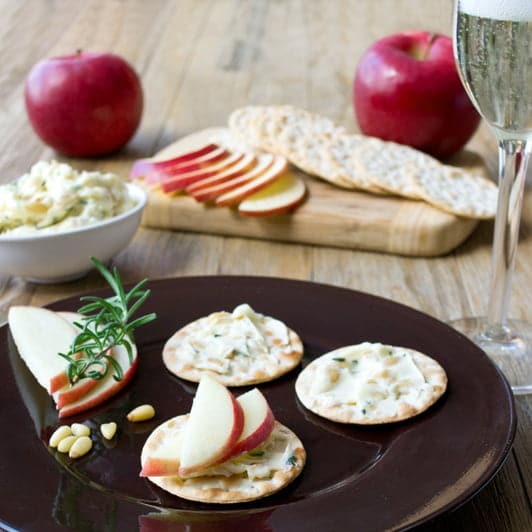 When the RubyFrost apples come to stores across the US, I’ll share some delicious apple recipes with you. For now, I’m going to help you get excited about this new apple variety by telling you about it and telling you about some things that taste amazing with it. The RubyFrost is one of two apples that was developed by a partnership between Cornell University and the New York Apple Growers Association. It has a beautiful red color. So beautiful in fact, that when my box of apples arrived I immediately snapped a picture to share on Instagram. The RubyFrost is not a super-sweet apple but instead is sweet and a bit sour at the same time. What I love most about it is how crisp and juicy it is. RubyFrost apples make a good snacking apple, refreshing and crisp. But they also hold their own for cooking and baking. In developing recipes for the RubyFrost, I found that it softened and took on a cooked texture relatively quickly but that it didn’t get mushy. 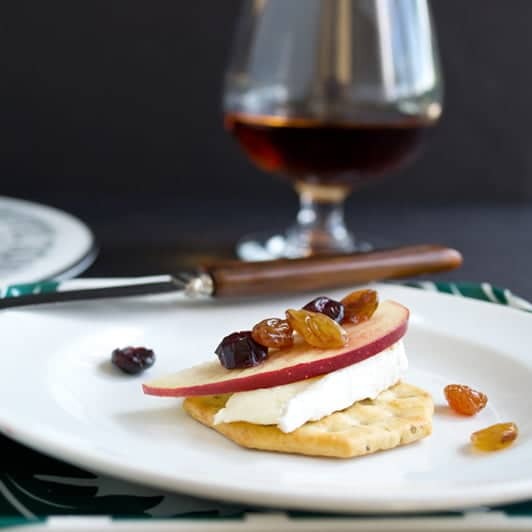 Or make one of the following three RubyFrost Apple Accompaniments. 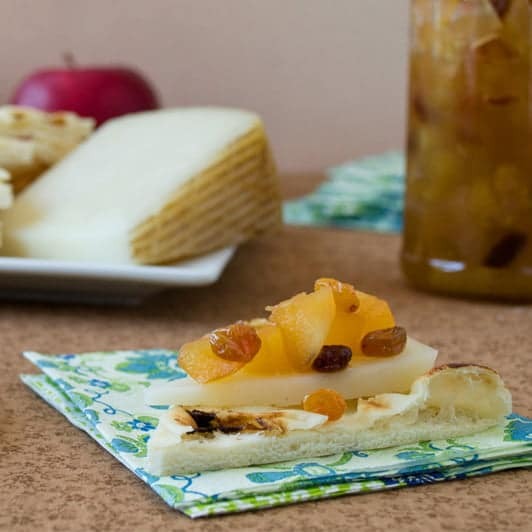 These are simple recipes that pair deliciously with RubyFrost apples. 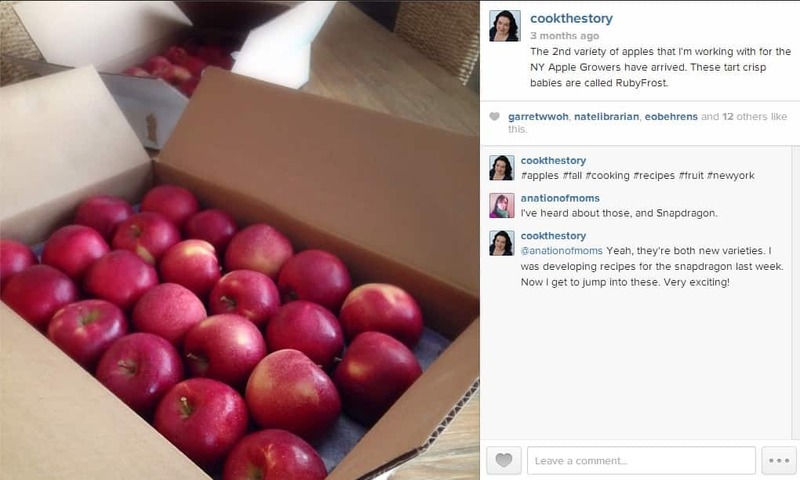 (The recipes are over at the New York Apple Growers’ site. Click on the image to get to the recipe there). Of all the flavors I’ve suggested, which one do you most want to try with the RubyFrost Apples? Head over to the Cook the Story Facebook Page and post about it. Or scroll down to leave a comment here. Disclosure: I was paid by the New York Apple Growers to develop recipes, photograph and promote their apples. All opinions are my own. More than half my friends are gluten-free now, so I’ve had to scramble for appetizers. These would make a stellar addition to a cheese plate. I’ll be keeping an eye out for these to make it to the West Coast!